The US Life Expectancy Decreased for First Time Since 1993! I am constantly reading and watching for news related to health. It was sad to see this report: For the first time since 1993, the US life expectancy decreased (Already one of the lowest in the world) !!!!! 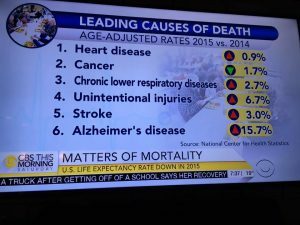 15.7% increase in DEATH from Alzheimer’s! Dr. Hugh Fudenburg, top immunologist in the world states if you receive 5 consecutive Flu shots, you increase your risk of Alzheimer’s by 10 times! drugs. They even want to put everybody including children on cholesterol lowering drugs as a preventative measure. Our country prescribes the most medications in the world yet out of 37 developed countries our health is rated dead last! We have 2 to 3% of the worlds population but consume 75% of the world’s drugs. Medicine does not make you healthy! These drugs mask symptoms and lead to more side effects that the doctors then just prescribe more drugs. This will not increase the US life expectancy. The current sick care system of running to the medical doctor for symptoms is a total failure. These are more signs that we need people to take responsibility for their health and make lifestyle changes! Education of you and your children related to diet, lifestyle, exercise etc.. is how we improve this.. STOP the overmedicating and over-vaccinating! I would like to help you and your family be more healthy. Chiropractic is more than just pain relief. It is about removing stress to your nervous system so your body, organs, muscles can all function optimally and be healthier. I want to show each of you now important nutrition and cleansing is to remove toxins from the body. We have to remove inflammation from the body because it leads to many diseases. We have to make sure your adrenal glands are functioning properly to make sure your hormones are balanced. The important thing is you have to take the first step in making the change by asking me for the help. Prevention and maintenance is key to staying healthy. This is how we can increase the US life expectancy! Are you ready for real healthcare? Are you ready for the change in 2017? Are you ready to make your HEALTH a priority? performance car and you put low grade fuel into it: the car will get lower fuel efficiency and break down. 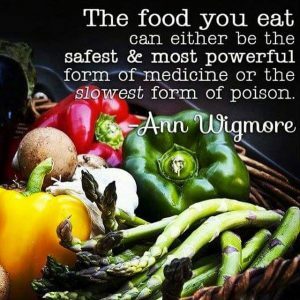 Are you ready to fuel your body with better nutrition and help it heal? I wrote a blog post about diet and how it can effect a disc injury. Most patients have damage to the discs. You can read the blog to find out what you should be eating if you have a disc problem: Diet for your Disc Injury! Our food supply has become depleted of nutrients. Many people tell me they eat healthy. The problem is many of the foods don’t have the nutrients they once did. Our soils are depleted of many elements because they are over farmed. 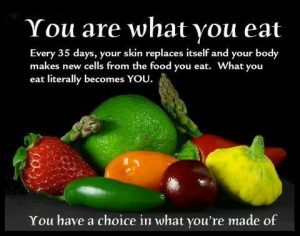 This is why it’s so important to supplement with a quality vitamin, minerals, anti-oxidants. Read another blog post I wrote: Nutritional Support for Your Joints! All vitamins and supplements are not created equal. I have patients bring me in their bottles of vitamins and whey protein. It’s sad what many stores are selling to you as healthy supplements. Many have toxic substances, unhealthy artificial sweeteners, vitamins that are artificial and non absorbable (which can cause digestive problems and ill health). If you are ready to be more healthy, you can contact our top rated Chiropractor in Freehold or talk to us at your next appointment. 1) One of the most effective multi-vitamin on the market containing your complete profile of vitamins, anti-oxidants and omegas: Complete Essentials Daily. making changes. Start supplementing your body to heal the tissues and cells. If you are ready to take your health to the next level, lets talk about our full body nutritional cleanse system which detoxifies the body at the cellular level. This helps you remove chemicals and remove weight and body fat all while building lean muscle, resetting your metabolism and reducing inflammation. I’m ready to make you a healthier you so you can enjoy life again.